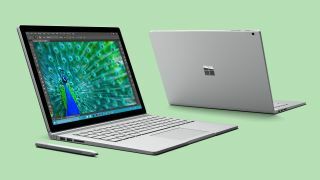 Microsoft's Surface Book, billed as the "fastest 13-inch laptop ever made" by the company, has been impressing all and sundry since it was unveiled, and now we have confirmation that the device is also highly flexible in the upgrade stakes. As you're probably aware, while the Surface Book looks like a traditional laptop, it's actually a convertible with a nifty hinge mechanism that enables the display to be detached and used as a tablet. While the tablet section contains the CPU – obviously enough, otherwise it would have trouble running when detached – the base hosts the discrete Nvidia GPU which graces the costlier models, and which gives them considerably more oomph in the graphics department. The great thing is that you can actually swap the base of the machine for a different base, and it will still work seamlessly with your tablet section. Indeed, Microsoft has confirmed to The Next Web that the entry-level Core i5 Surface Book, which only has integrated graphics, can have its base swapped with a higher-end base unit that contains the discrete GPU. In other words, upgrading is as simple as plugging a new base in. Hopefully, that means when it comes to the Surface Book 2, owners of the first-generation model will be able to opt to upgrade the base alone for a boost in power (and of course other considerations such as connectivity, as ports and the like are bound to be changed as well). In short, the Surface Book offers quite a degree of flexibility in this respect – assuming, of course, that Microsoft is happy to sell punters a standalone base unit. It's still not clear whether this will be the case, although there's no reason why the firm shouldn't, in theory anyway.